A comprehensive side-by-side examination of the Apple and Samsung flagship smartphones was performed by display testing firm DisplayMate Technologies, which found the iPhone 5's 4-inch Retina display to be more refined than the OLED unit found in the Galaxy S III. 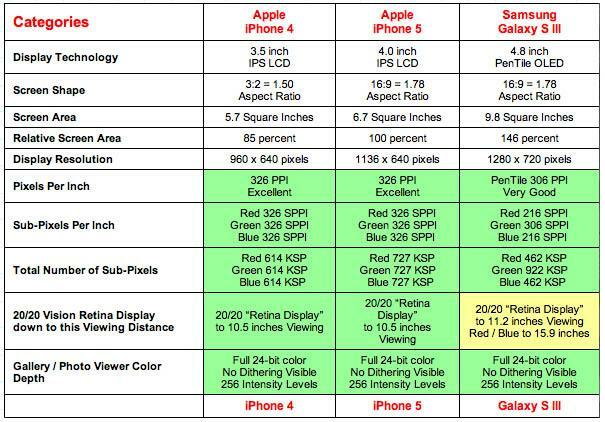 DisplayMate's "Flagship Smartphone Display Technology Shoot-Out" not only pitted the iPhone 5 against the Galaxy S III, but added in the iPhone 4's Retina display to show how Apple's display technology has advanced over the past two years. The test consisted of numerous tests covering screen reflections, brightness and contrast, colors and intensities, viewing angles, display power consumption and effect on battery life. "Apple has uncharacteristically understated how much better the display is on the iPhone 5  something that could be an important factor for those considering whether to upgrade," said DisplayMate's Dr. Raymond Soneira. "In every category that we measure (except Brightness Decrease with Viewing Angle), the performance of the iPhone 5 display has improved over the iPhone 4, sometimes by a bit and sometimes by a lot." Compared to the iPhone 4, the iPhone 5 has decreased screen reflectance by 52 percent, boosted contrast by 57 percent and improved color accuracy. Soneira notes the iPhone 5's display calibration is very good and, while suffering from minor gamma intensity, that "It is still probably more accurate than any display you own, unless you have a new iPad." ] it is the Brightest Smartphone we have tested in the Shoot-Out series, it has one of the lowest screen Reflectance values we have ever measured, it has the highest Contrast Rating for High Ambient Light for any Mobile device we have ever tested, and its Color Gamut and Factory Calibration are second only to the new iPad. What are the downsides? The White Point is still somewhat too blue like most Smartphones, and at Maximum Brightness it has a shorter Running Time than the iPhone 4, which is not surprising since it has a larger screen and a larger Color Gamut but roughly the same capacity battery. As for Samsung's Galaxy S III, the device's PenTile display performed admirably, but the OLED technology the screen leverages is still being perfected and is not up to par with the LCD tech used in the iPhone 5. The Brightness is about half of the iPhone 5 due to power limits from the lower power efficiency of OLEDs and concerns regarding premature OLED aging. The Color Gamut is not only much larger than the Standard Color Gamut, which leads to distorted and exaggerated colors, but the Color Gamut is quite lopsided, with Green being a lot more saturated than Red or Blue, which adds a Green color caste to many images. Samsung has not bothered to correct or calibrate their display colors to bring them into closer agreement with the Standard sRGB / Rec.709 Color Gamut, so many images appear over saturated and gaudy. Running Time on battery is less than the iPhone 5 due to the lower power efficiency of OLEDs, even given that the Galaxy S III has a much larger battery capacity and much lower Brightness. Overall, the iPhone 5 scored an "A" rating while the Galaxy S III earned a "B+" on poor calibration and viewing angle issues.